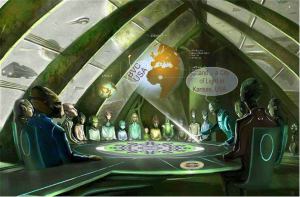 Bordon reported from his meetings with the Linkage Institute, an interspecies group of extraterrestrials concerned with Earth, how they planned to get us past the dangers of Nibiru crossing through the inner solar system between Mars and Jupiter. The ETs saved us. They shifted us into a parallel time line so we bypassed Nibiru’s visit to our inner solar system. Hosts Janet Kira Lessin & Dr. Sasha Lessin interviewed Michael Lee Hill July 21, 2014 on Extraterrestrial Radio on Aquarian Radio on www.blogtalkradio.com/aquarianradio. On this show–which you hear when you click the Blue arrow [not the white one] on the second icon below– we talk about the work of AR Bordon and his experiences with The Linkage Institute. The entire human race has to vibrate at certain frequencies as a mass consciousness to TUNE into various Realities–from the most FEAR based thought-forms to the Most LOVE filled realities out of the numberless parallel universes and timelines and everything in between. But AR Bordon, my insider friend I have learned so much from shared the following in his only published article ever released to the public. The 3 percent protocol is recognition that when 3 percent of the population of a given life form (monkeys, fireflies, rats, dogs, cats) acquires and manifests a new behavior, the remainder acquires and expresses same as if by magic, regardless of distance or generational lineage. There are seven centres of resonant harmonic entrainment located in all continents. We know the location of four of them, and work at locating the remainder. We know how they work and what our part is in the process that entrains us human beings.